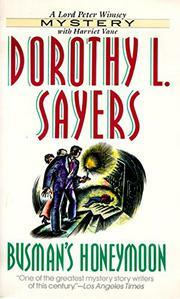 Sure fire -- and don't miss the opportunity of selling Dorothy Sayers as straight fiction rather than simply as mystery. Personally, we liked it better than Gaudy Night, which is high praise. Subtitled "A Love Story With Detective Interruptions", this proves to be the story of Harriot and Poter's marriage, their trip to the newly bought country place which they find wholly unprepared. Next day reveals; the reason -- and peter is off in full cry to solve the mystery. The attendant investigation underlines the adjustments that both Peter and Harriet have to make, and the marriage, in spite of interruptions -- comic and tragic -- gets a solid foundation for the future. Excellent slouthing -- good entertainment -- a book for intelligent readers.